This intensive, exciting workshop will awaken the possibilities of the woodcut printing process for the beginning and advanced printmaker. This approach is not technically tradition-bound...but inventive, with contemporary, creative methods, that can be spontaneous, simple and direct. 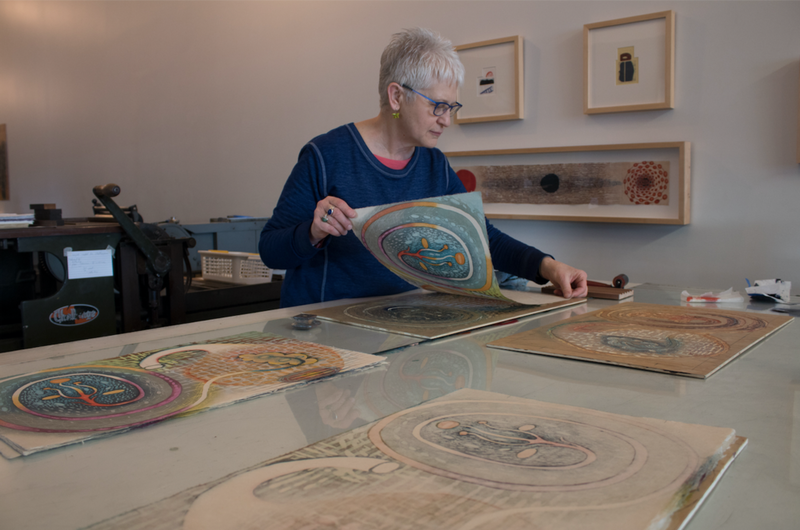 This expressive medium will be introduced and explored through demonstrations and discussions of cutting techniques, oil-base ink, and printing with the etching press, as well as by hand. Participants will go from designing their images and cutting blocks, to printing a limited-edition print series using a variety of methods and individual discoveries. Karen Kunc explores inventive color abstractions of the natural and human-fashioned world in her prints and artist books, creating ideas of ‘strange beauty’. Kunc is a Cather Professor of Art at the University of Nebraska-Lincoln. Awards include Fulbright Scholar Awards to Finland and Bangladesh, two NEA/MAAA awards, the 2007 SGCI Printmaker Emeritus Award. Her works have been shown in exhibitions nationally and internationally and are held in numerous collections: MOMA; Library of Congress; Milwaukee Art Museum; Haas Arts Library Yale University; Jyväskylä Art Museum, Finland. She has taught workshops around the world, in Egypt, Italy, Finland, Bangladesh, Poland, Japan, France, Mexico, Iceland, Spain; and she has lectured as a visiting artist to over 200 institutions. Kunc has recently launched Constellation Studios in Lincoln, Nebraska, as a creative destination for artist residencies, collaborations and workshops in print, paper, book.